Teachers Report Stressed, Anxious Students In The 'Age Of Trump' : NPR Ed In a national survey by UCLA researchers, teachers say they have students who are concerned for themselves and their families. And some teachers have seen a decline in classroom civility. Multiple students agreed. An argument ensued. After class, two Latina students came up to the teacher and said: "He doesn't need to be saying stuff like that in class. We are worried for our well-being. We're worried about things not going good for us." The anonymous anecdote was collected as part of a new UCLA survey. In it, teachers report that in the current political climate, some of their students fear for themselves and their families. Others reported that students seem more "emboldened" to express racist and derogatory views. Even as the first lady spent time this week touring schools to promote caring and inclusion, many are ready to chalk up a new incivility in schools to the Age of Trump. Previous surveys we've reported on, including one from the Southern Poverty Law Center, also found increases in school bullying related to overheated political rhetoric. conducted 35 follow-up interviews by phone. 79 percent of teachers reported that students have expressed concerns for their well-being or the well-being of their families because of what is in the news. Most commonly mentioned was immigration, but the list also included the much-publicized travel ban, restrictions on LGBTQ rights, threats to the Affordable Care Act and threats to the environment. 51 percent of teachers reported more students experiencing "high levels of stress and anxiety." 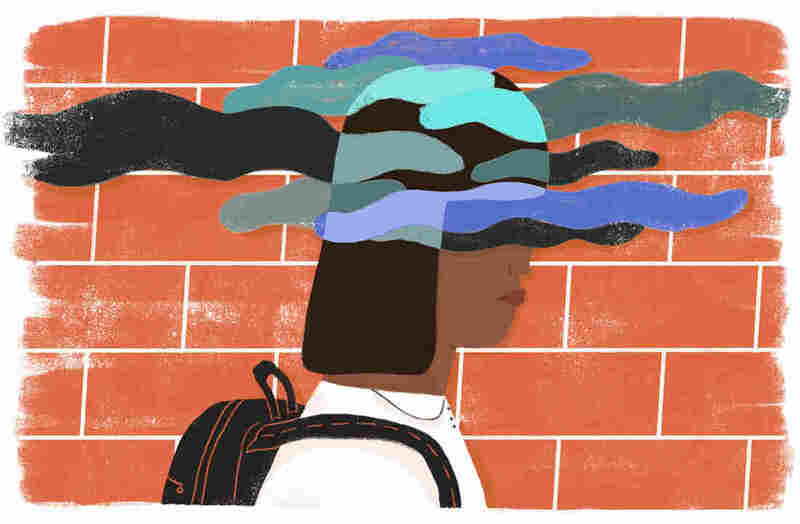 44 percent of teachers reported that students' concerns were affecting learning. In interviews, they spoke about students who seemed stressed, distracted and who were contributing less to class discussion for fear of drawing attention to themselves. 41 percent of teachers reported that students were more likely than in previous years to introduce unfounded claims in class discussions, such as from Facebook or talk radio. 27 percent of teachers reported an increase in students making derogatory remarks about other groups during class discussions. This included sexist as well as racist and anti-Muslim comments. 20 percent of teachers reported heightened polarization on campus and incivility in their classrooms. These last two figures were higher for teachers at predominantly white schools, says John Rogers, lead author of the report and a professor at UCLA's graduate school of education. He noted that teachers in eight states used the word "emboldened" to describe some white students' increasingly racist and offensive behavior. The report is not comprehensive, and there's no easy way to compare its results with those during any previous administration. But it speaks to an ongoing national discussion about civil discourse and civic engagement inside and outside the classroom. White nationalists like Richard Spencer are coming to college campuses purporting to embody free speech, even as their supporters commit violence. Former President George W. Bush, and retiring Repubican Sen. Jeff Flake, each in a recent speech drew a line between the rhetoric that flies on Twitter and television, and what students in school are learning about the bounds of acceptability. "Bullying and prejudice in our public life sets a national tone, provides permission for cruelty and bigotry, and compromises the moral education of children," Bush said. "The only way to pass along civic values is to first live up to them." "It is often said that children are watching. Well, they are," said Flake. Ron Avi Astor, who researches school climate at the University of Southern California, follows Rogers' work closely. He cautions that teachers may have a "really different" view of what is going on in their schools than students do. A high school teacher, for example, may have 200 students in the course of a day, Astor explains. And if she sees problems happening with one or two of them, that doesn't necessarily generalize to every student in a school. However, he says the results of this survey conform with what he has been seeing in the field and hearing from administrators and teachers. Astor says he has seen schools in Los Angeles, where he lives and does research, taking steps to protect students who are worried about immigration crackdowns. "You don't need a big study to know that kids turn on the TV and they see and hear the nastiness that's going on," he says. UCLA's Rogers says the survey suggests that the political climate may be chilling classroom debate. "Teachers said they avoided talking about topics they otherwise would discuss, or had lessons that were more controlling and less engaging than in the past." One teacher said, "I'd been trained to bring all different student perspectives into the discussion, but I don't quite know what to do when it creates a threat for other students or undermines a sense of community in my classroom." Teachers told the UCLA researchers that they wanted more professional development and more leadership from their administrators on how to balance these concerns. "It would be troubling," says Rogers, "if the lesson was that schools need to back away from civic and political life."